For an Australian author like Richard Flanagan, there is material enough for a great novel just telling of the lives and suffering of Australian prisoners of war during World War 2. Even more so considering his father was just such a prisoner on the Burma railway, something Flanagan speaks of 'imbibing' while growing up. Instead he settles for a broader and more difficult panorama. Alongside the adept before and after descriptions of Australian soldiers - of love affairs and guilty confusion - we are also taken into the minds of Japanese officers and Korean soldiers and dystopian post-nuclear Japan. Somehow it all rings as true as his depictions of Melbourne society and Tasmanian poverty. The heat of Adelaide is pitched against the humidity of Siam and the unresolved heroics of an Australian surgeon against the inconclusive brutality of Japanese prison commander. It is not a triumphant book or a cheery one, and it offers little hope except that sometimes people survive, despite all that they go through, and some don't. One or two sections lift above this determined (and understandable) nihilism - a scene of diggers repentantly dining on fish and chips with a grieving but generous Italian immigrant. A father setting aside his ambivalence for heroism, as he had done previously in the jungle, and rescuing his wife and children from the madness of a bushfire. But an easy hope is a fake one and that is far away from what Flanagan seeks to achieve in The Narrow Road to the Deep North. There are no living gods in Flanagan's war and post-war and that must have been the feeling of many, but not all, who lived and died or lived and lived. 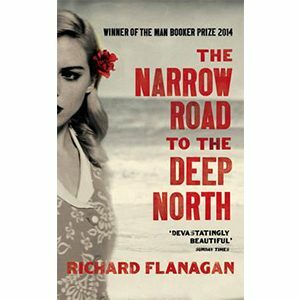 For an extended interview with Richard Flanagan about The Narrow Road to the Deep North, visit The Monthly. The Narrow Road to the Deep North is a very satisfying book. Though it took me some time to grasp what the author was saying, and the Tasmanian landscape the novel begins with, once the narrative started making sense, I was in the grip of this powerful story. In plain, unhurried words, the author creates the harrowing world a PoW camp is. The setting is the site where the Japanese Imperial Army is having the Australian prisoners of war build the Siam-Burma railway. Through various characters, both Australian and Japanese, also Korean and American, their back stories and what they do after the war, how they return to their families, or how they are put to trial as war criminals, the futility of a war has been shown. It is difficult to write the gist of this novel, for war isn't its only theme. There is also the futility of life. One realisation that I came to while reading this novel is that life is too short, and it is moving very fast. This realisation brought a lump in my throat, and I found myself going somewhat teary at certain places, like, in the chapters in which the Korean guard called Goanna is put to trial and hanged. The best thing about this novel is how simple it is. Its canvas is huge, like how it is with most war novels, but it does not make any huge claim. The characters do not speak grand language. In fact, the novel is so simple, even the speech of the characters are not pur in inverted commas. Yet, this book is a force. It hits you hard, and in the right way. I won't be surprised if The Narrow Road to the Deep North wins the 2014 Man Booker Prize.